Resilience to, and recovery from, a major disaster is a challenge even in wealthy, well-prepared countries like the U.S. or Canada. For lower income countries like Haiti, it is even more difficult. Jonathan Katz, in his excellent book The Big Truck That Went By, explains many of the reasons why reconstruction has faltered, and the humanitarian aid has not had its intended effect. Katz reminds us that less than 1% of the aid was channeled through the Haitian government, so they cannot be faulted as much as some reports suggest. Various external governments and NGOs have not performed well. Moreover, some of the ‘help’ has proven deadly. An outbreak of cholera, unknown in Haiti for a century, killed more than 8,000 people as of late 2013, with over 300,000 Haitians hospitalized and over 600,000 (more than 6% of the population) contracting the disease. It was almost certainly introduced into the country by Nepalese soldiers, who were part of the United Nations mission. In late 2011, hundreds of thousands of people were still living in makeshift tents. I was a passenger being driven along a main street in the capital. I saw the camp of tents, and took this photo through the car window. It was only later that I paid any attention to the hoarding, an advertisement for fancy aluminum windows and doors. The contrast was striking. Housing plays a direct and indirect role in health, affecting both physical and psychological status (Shaw 2004). 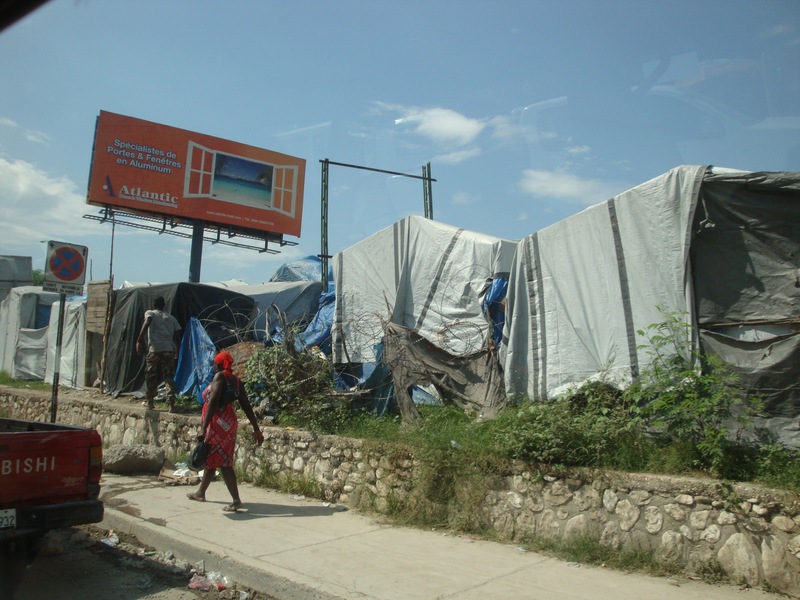 It’s crucial for Haitians that efforts to ‘build back better’ are successful in the future. Shaw M. 2004. Housing and Public Health. Annual Review of Public Health 25(1): 397-418. http://dx.doi.org/10.1146/annurev.publhealth.25.101802.123036. Harry Shannon (maggie@yorku.ca) is a Professor in the Department of Clinical Epidemiology and Biostatistics at McMaster University in Hamilton, Canada.